Adam's & Brooks deliciously distinct candy products have been enjoyed since 1932. A&B has a full line of true recipes made with the freshest ingredients along with high quality manufacturing processes that are combined with a superb packaging. Adams & Brooks candies are so delicious and is the reason that keep everyone coming back for more! Adams & Brooks Candy makes mouth-watering treats that are unique in style and colors and will leave your taste buds surprisingly shocked and craving for more. With a variety of colors and flavors, these awesome candy delights are ensure to brighten up your day every time. Bring them to school or work to make new friends. If you are not feeling generous, keep then for yourself. Adams & Brooks Albert’s Candy has got the goods when it comes to an amazing, fun, colorful and creative candy that is not just delicious but playful. Albert's Candy treats are out of the ordinary and it will make a difference on any special event or party. Bring alone our colorful confectionary creations that includes candy, chocolates, toys and gums made with quality ingredients and beautiful designs. With a range of Lollipops, Novelty Toys, Fruits Chews, Candy Straws, Frunas, Ice Cubes Chocolates and Belgian Chocolate Roses, Bubble Gum bags, Twisty Pops Toys, novelties and bulk choices are available. Albert’s Candy is as unique as fun. Adults, kids and the whole family will enjoy it. Perfect for a birthday with all the flavor combinations. Seasonal items are available with a pre-order. Don’t forget to check the section with time to plan the next season. Albert’s Candy will meet all your expectations. Albert's Candy Anastasia Confections are the makers of the world famous Coconut Patties and the award winning Coconut Cashew Crunch. The coconut confections experts of Anastasia Confections have created a National line of coconut inspired products to feed consumer frenzy for all things coconut. Using simple methods as well as mixing clean ingredients. Nothing artificial is added. Atkinson makes candies and treats the good “old fashioned way”. Recipes have been updated to show a proud family tradition of making real candy, real fun. Atkinson Candy is ideal for Family Events and Parties. They have available, Gluten free , vegan, sugar free and Kosher Candy. Atkinson Candy Bud’s Best Cookies offers a combination of freshly bake cookies and snacks with a variety of delicious flavors and choices. Prior to starting Bud's Best in 1991, Bud Cason owned and ran Greg's Cookies in Birmingham. He purchased the business in 1970. Bud Cason has been in the cookie business for over 50 years. Al, his son, is now the president of the Company. Bud’s Best Cookies C&C Cola taste tradition dates back to 1865. C&C Cola was founded in Belfast, Ireland. After moving to America in 1955, the company became known for its cone top cans. Cone Top Flavors became an instant hit. They retained the same formulas when were upgraded to “state-of-the-art” pull-top cans. Caprisun The original and all-around great tasting snack. With 25% less sugar than other leading juice drinks, plus no artificial colors, flavors, or preservatives, it’s still a favorite of moms and kids alike. Still the most sought after fruit drink with the great taste that kids love. No artificial colors, flavors or preservatives. No high fructose corn syrup and 25% less sugar than other leading juice drinks. Perfect for the school lunch box, picnics, the beach, camping or just when you’re on the go. First it's candy, then it's gum! Morphing from a tasty, fruit-flavored candy into an equally tasty and chewable piece of gum. Razzles offer a hybrid of two treats in every round, bite-sized piece. The Candy You Play With is The Candy Blox Activity Box.It comes with edible bricks in three different sizes to build, stack, and eat when you're done. Nik-L-Nip Mini Drinks have been a party and holiday favorite. The “Bite ‘Em, Drink ‘Em, Chew ‘Em” Nik-L-Nip wax bottles offer a nostalgic candy version of popular, fruit-flavored drinks. They’re a tasty, fun, kids treat. are made with real fruit.Whether you’re running a day care center, working with your local church, or helping run a summer camp, you can treat the kids to a great-tasting fruit snack bar at a price you can afford! Moist cake-like cookie surrounds a chewy fruity center, plus they’re made with real fruit and are low fat, too. Also great for parties, picnics. The bars comes in various flavors, including fig, apple, blueberry, and strawberry. is the exclusive U.S. importer for many companies from around the world and has an impressive lineup of brands that range from premium chocolate to kids candies with a little bit of everything else in between. 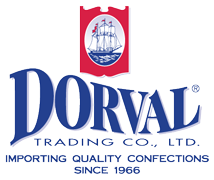 A privately held company, Dorval focuses on delivering quality candy products to our customers throughout the United States. another bran that brings you that sweet and tart taste that kids (and kids of all ages) love! Foreign Candy Frankford have been dedicated to making your family smile for more than 70 years. Their products are designed to bring a touch of sweetness into your traditions. Let's continue to pass on the happiness that candy brings.